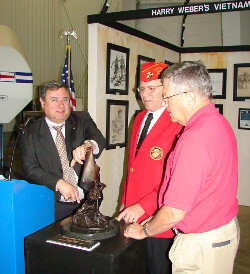 Academy Vice President Dr. T.J. Rosandich (left), Jesse Andrews Jr. Marine Corps League Detachment Commandant Jerry Cherne (middle), a retired U.S. Marine Corps chief warrant officer, and USS Alabama Battleship Memorial Park Executive Director Bill Tunnell (right) unveil artist Harry Weber’s “Wounded Warrior” sculpture as part of an art donation by the Academy to the battleship on May 5, 2011 in Mobile, Ala.
For Harry Weber his sketches as a 24-year-old while serving in the U.S. Navy on river patrol boats in the Vietnam War remain some of the renowned artist’s most treasured creations. Talking about his collection of sketches, “A Warrior’s Sketchbook,” puts Weber right back into the tall reeds — dirty, dripping wet and covered in bug bites. Despite the conditions, he captured the behind-the-scenes events of his fellow warriors in battle as often as he could scrounge up something to draw on and draw with. His artistic tribute to those who served was donated by the United States Sports Academy along with a bronze sculpture, “Wounded Warrior,” to the USS Alabama Battleship Park during a recent presentation at the USS Alabama Memorial Park Aircraft Pavilion in Mobile, Ala. The ceremony included 25 members of The Jesse Andrews Jr. and P.L. Wilson Marine Corps League Detachments who led the presentation of the colors, the pledge of allegiance and a moment of silence for all Prisoners of War and war veterans. Bill Tunnell says the faces in Weber’s sketches bring to life the USS Alabama’s Vietnam-era exhibit, which includes a POW’s cell and one of three river patrol boats on display in the country. Weber, an award-winning artist who earned the Academy’s American Sport Art Museum and Archives (ASAMA) 2011 Sport Artist of the Year Award, says the 13 Vietnam War sketches amount to about 10 percent of all the drawings he did during his tour of duty and remain among the only ones that survive today. Unfortunately, most of the sketches were lost or destroyed in Vietnam. The compelling series of sketches Weber compiled chronicling his experiences, include warriors in everyday life from patrolling the rivers and transporting Vietnamese prisoners to eating C rations for breakfast and stealing brief solace behind sand bags during fighting. Weber’s Vietnam War sketches follow in the footsteps of painter Donald Moss. Moss is another Academy Sport Artist of the Year, winning in 1985. He drew his impressions of the Battle of Guadalcanal during World War II, while fighting there as a young U.S. Marine Corps private. Weber’s “Wounded Warrior” sculpture depicts a citizen soldier who appears distressed and is either defiantly planting his Battle Flag or supporting himself with it. “Wounded Warrior” is a small study for a planned heroic sculpture to honor the United States citizen-soldier. The sculpture, which conveys the warrior’s unique courage and strength to carry on even in harm’s way, is meant to represent no specific branch or period of American military history, and is deliberately ambiguous in several aspects. His planting of the flag symbolizes the interdependence between soldier and country. The flag also suggests national allegiance and the bond between the warrior and his comrades. Weber, who earned an art history degree from Princeton University before joining the Navy, has developed more than 100 large sculpture works and more than 200 smaller pieces. His sculptures have won several major awards at national juried competitions. His works appear in private collections in the United States and abroad, on the covers of numerous national magazines and in museums throughout the country. Monumental works that Weber created of famous sports figures are prominently featured at 12 different professional and college stadiums.